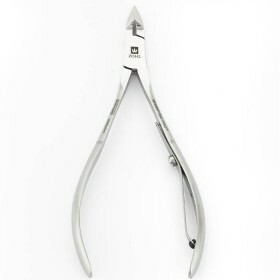 Sought-after by manicure professionals, cuticle scissors Topinox® by Niegeloh Solingen feature perfectly aligned slim blades and allow delicate and smooth cuticle trimming. Professional quality stainless steel Topinox® is suitable for sterilisation and does not contain nickel – a perfect manicure choice for anyone with sensitive skin. Maximum precision and durability guaranteed by Niegeloh Solingen Since 1936. Niegeloh Solingen cuticle scissors Topinox® feature slimmer blades than Niegeloh nail scissors in model 44878, for precise trimming and detailing of your cuticles. They are made of specially tempered Topinox® stainless steel - Niegeloh's best-seller in professional quality, and have a 24 carat gold-plated screw for added durability. Topinox® has been approved for decades in the finest surgical instruments and keeps its sharpness for a very long time, to allow a very precise cut - time after time. 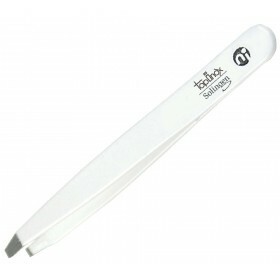 Topinox® cuticle scissors feature manually finished blades, slightly curved and individually tested for an easy, even cut. Up to 18 grinding steps are done on each pair, to ensure the blades are perfectly sharpened and leave healthy-looking cuticles. Characteristic multi-tone satin finish is achieved throughout hours of grinding in the old traditions of Solingen finest cutlery making. With excellent ergonomic design, the scissors fit comfortably into the hand and allow you maximum control, without creating that bulky feeling. Superior Niegeloh quality does not end there: Topinox® cuticle scissors are anti-allergic, sterilisable and do not contain any nickel – important for those with sensitive skin or nickel-related allergies. Great for use by professionals in salons and anyone who looks for durable German scissors, to take great care to their cuticles. Length: 9 cm. purchased this for the wife so she would have her own personal care kit .she was not dioanpsipted finds it very practical and stylish to carry in her handbag .the packageing though when it was delivered was not perfect as one of the items had come loose during delivery ,however this did not damage the product ,and overall very pleased . Finally a cuticle nail scissors that trim my nail skin without tearing it! What a great product for anyone who loves a great manicure. The blades of this scissor are thin and very precise. This was the first time i tried niegeloh topinox products and what an absolute surprise. good old quality that lasts!